Stop the War! Bring me home! We’re spreading plastic Army Men around the country and around the globe as small, everyday reminders of the ongoing horrors of the war in Iraq and to serve as tools to foster dialogue, action and resistance to the war. Here in the United States we’re encouraged to forget about the war, to go on with our lives, to “go shopping.” But what if everywhere people went there were little plastic Army Men nudging them to remember that we’re waging war? At Home Depot, on the gas pump, in the 7-11, at the post office, on the hood of the car, in the public restroom, at the movie theatre, in the produce section of the grocery store … in your neighborhood …? Help these little messengers appear everywhere— to be green plastic pin-pricks to the American conscience, to help create an environment in which it becomes increasingly difficult to ignore the war, the loss of life and the unending destruction. The war is not going away. We want people to realize that by doing nothing they contribute to a war that has cost the lives of almost 2,000 American soldiers and many, many thousands of Iraqi civilians (conservative estimates put the Iraqi civilian death toll, as of September 7th, 2005 at 27,718. Source: iraqbodycount.net). Join the Army Men Project – spread the plastic everywhere! Particpate! Distribute Army Men Near You! Send us Photos! Join the Dialogue! ARMY MEN: Please help us cover the United States and the globe with plastic Army Men. You can either order your own Army Men and download your own stickers or you can order them directly from Mouths Wide Open. PHOTOS: And please take photos of your soldiers in their various “outposts” and send them to us (click here for info on photo file size). 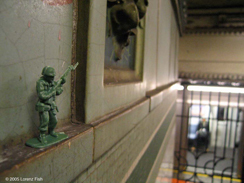 Add your photo to our Army Men Gallery— be sure to let us know WHERE the Army Man is. (click here for Images). And please check out OUR LINKS PAGE to access groups who are working directly with soldiers and soldiers’ concerns and to see articles related to militarism. Creating an environment in which Americans have been hospitable to making war on Iraq has been fostered, in part, by a growing militarism in our culture. This LINKS PAGE provides a great foundation of related articles describing militarism in fashion, video games, advertising, etc. which impacts and affects all of us every day. There is a minimum order, but believe me, putting them around can be addictive — or join together with friends! 2. CLICK HERE FOR THE PDF TEMPLATE for the stickers that say "Bring Me Home! www.mouthswideopen.org". There are 160 stickers on each sheet. 2 are printed on each label. 3. Use Avery labels (size: 5167/8167) or most any label sheet with 80 labels. The army men come in several poses. The labels fit under the stand in all but two that are crawling figures. Both crawling men figures can get stickers on their rifles, folded over in half. Take them with you on your daily chores and spread the dialogue— you'll find new and interesting places that these little soldiers can be located. SEND US PHOTOS of ones you place or come across!